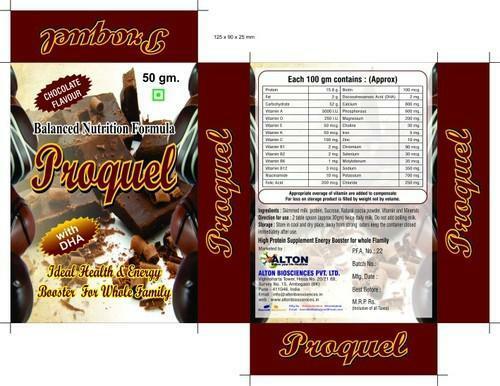 We are a unique entity in the industry, actively committed towards manufacturing and supplying a qualitative range of Sugar Free Protein Powder.Specifications:• Composition: Carbohydrate, protein, vitamin, etc. We are a unique entity in the industry, actively committed towards manufacturing and supplying a qualitative range of Sugar Free Protein Powder. • Composition: Carbohydrate, protein,vitamin, etc. We “Kenvit Biotech” are a Sole Proprietorship firm incepted in the year 2013 at Ahmedabad (Gujarat, India), have gained recognition in the field of manufacturing and supplying an outstanding range of Protein Powders, Energy Boosters, Vitamin Capsules, Folic Acid Tablets, Multivitamin Drops, Vitamin D3 Sachets, etc. These products are well-known for their accurate composition, long shelf life and high effectiveness. Owing to the outstanding marketing strategy of “Mr. Ujal Kapadia” (Manager), we have set a benchmark in this industry. We are offering our products under the brand names ET D3, MVIT-Z, B.COM, R-CAL, Zifer, MB-12, Zifer-Xt, MVL-Z, Ken-Z, Rosh-Z, Mypro-SF, etc.